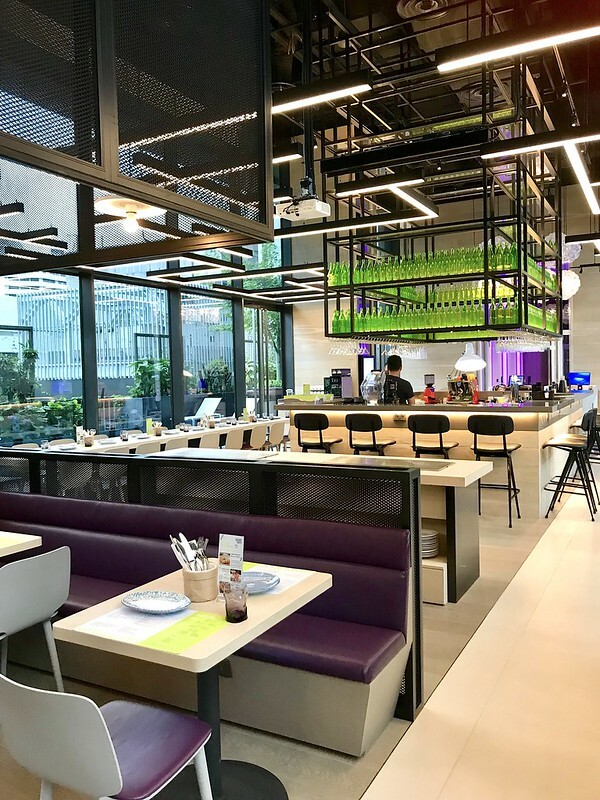 Inspired by first class travel which combines both luxury and cleverly compact spaces, Yotel Singapore is one of the more well-designed yet affordable new hotels to hit Orchard Road. 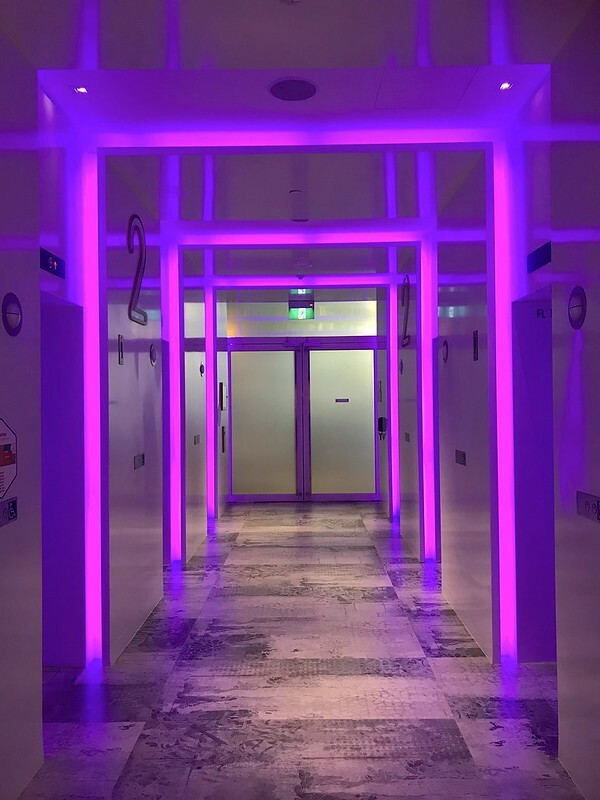 It opened in October 2017 with 610 rooms or "cabins" spread over 30 floors. 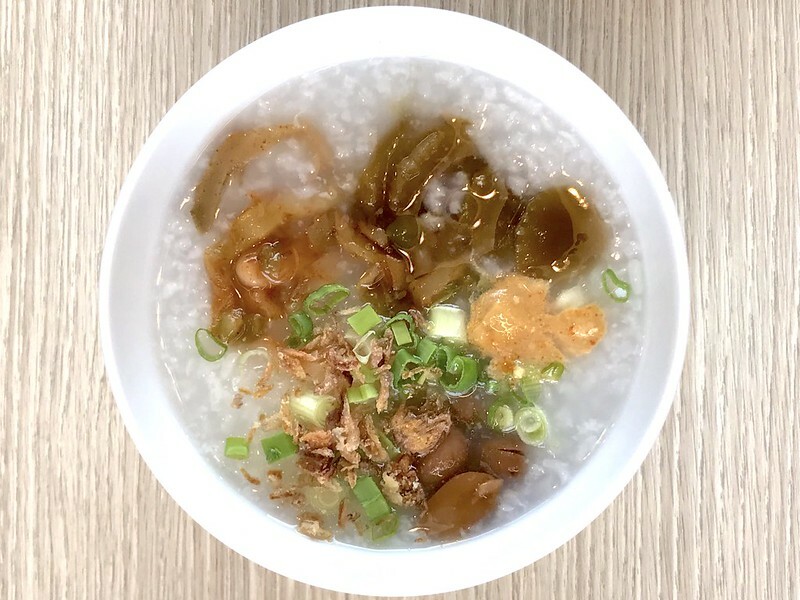 The location is right behind International Building near Shaw Centre, making it just across from Wheelock Place, Orchard ION and Orchard MRT. 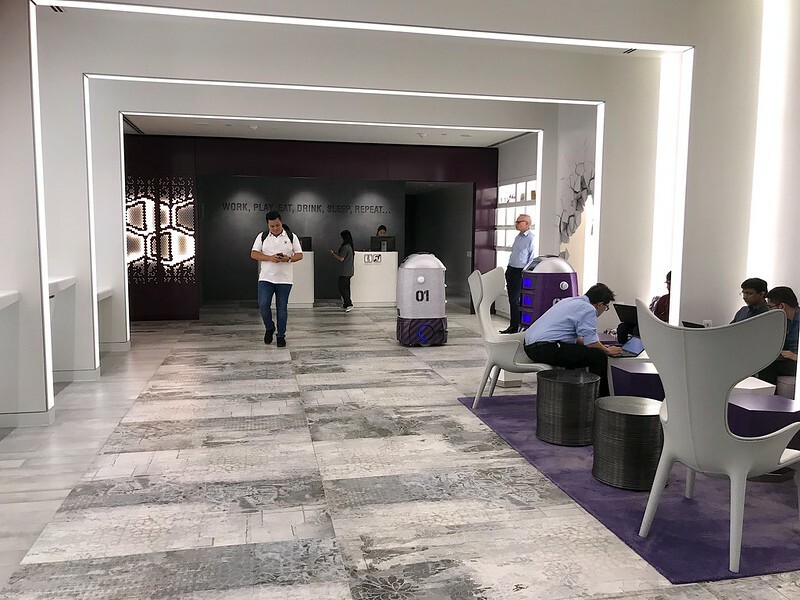 Coming up to the second floor lobby, you'll see an almost futuristic minimalist space with white, gray and deep purple hues. And just like in the airports, you can check yourself in. 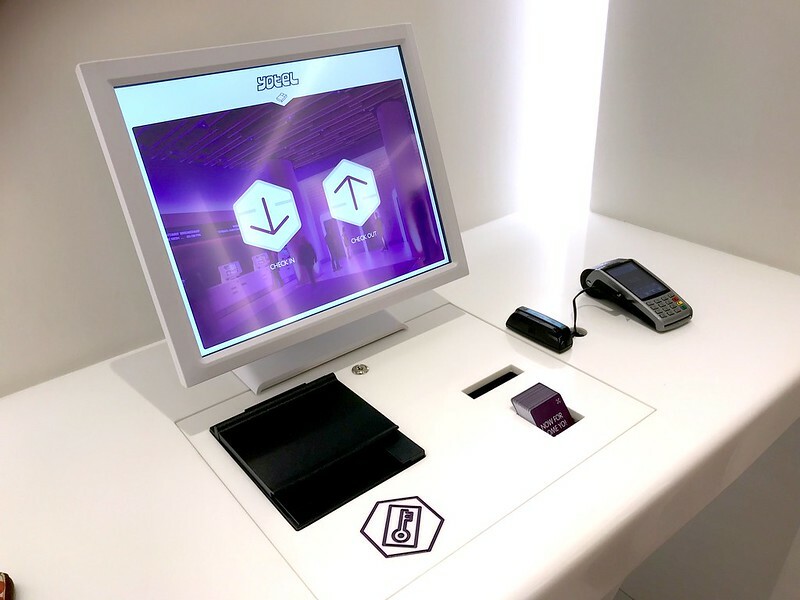 The machine will scan your ID document, credit card and activate keycards all quite quickly, but don't worry if you prefer to interact with a human being - that option is still available. Indeed, a cheery hotel staff swiftly materialised to assist us with our check-in when we seemed a little unsure with the digital check-in process. 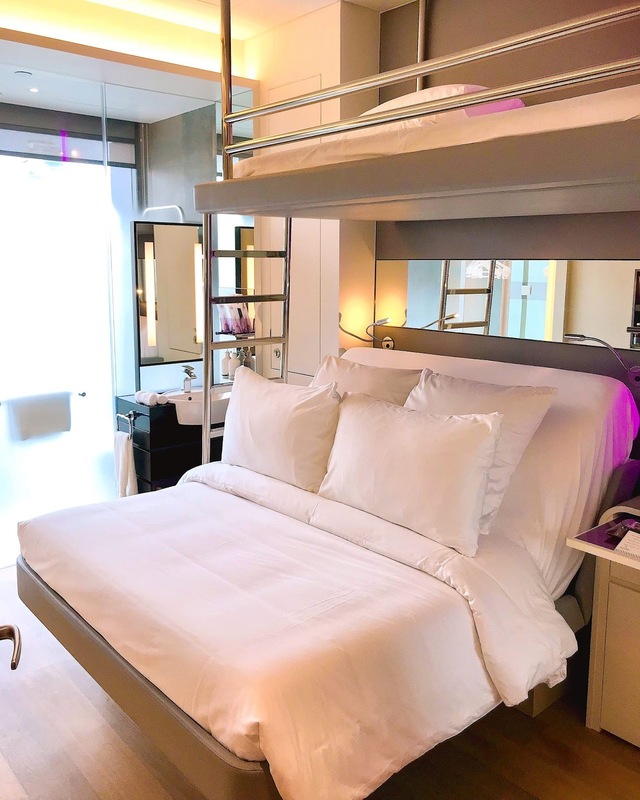 We loved the room - a Premium Queen cabin with bunk bed (perfect for the three of us) - which has a huge white adjustable SmartBed with Serta Gel cooled mattress and fluffy pillows. Everything is so inviting, soft and comfy, you won't want to leave the room. Technowall with mood lighting and a 40” HD smart TV with easy connectivity to own devices via Bluetooth and Miracast. There's super-strength WiFi throughout the hotel, suitably catering for the Internet-hungry generation. 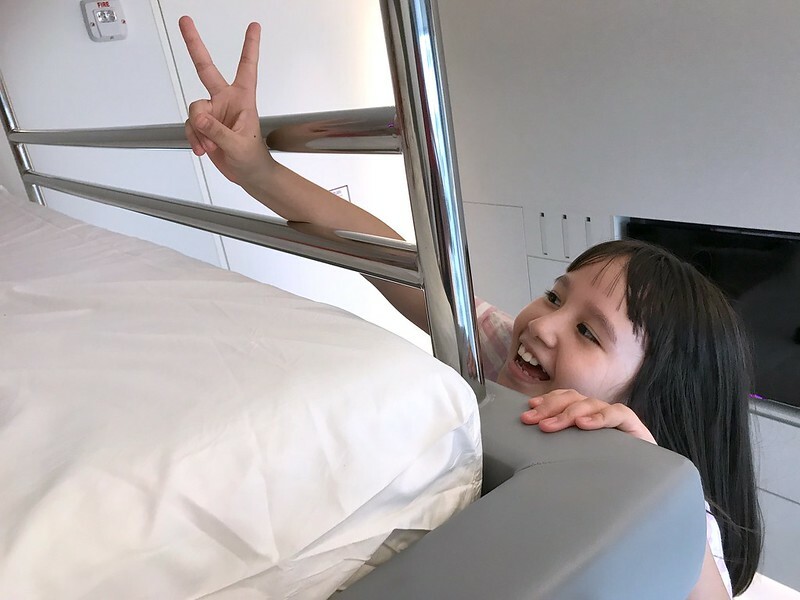 Kids and kids at heart will love the upper bunk! 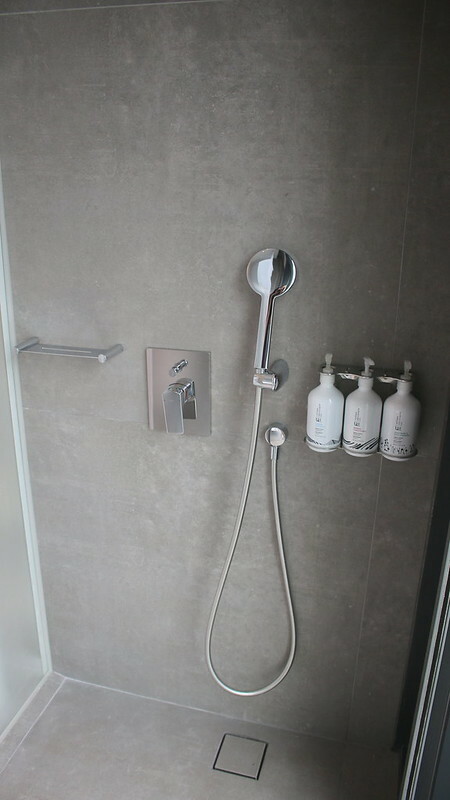 I love the simple, minimalist layout of the bathroom devoid of clutter. It is all condensed into exactly what you need, without extras. The monsoon rainshower in the bath is an awesome treat. I also like the fact that they use big dispenser bottles for shampoo, conditioner and lotion instead of fiddly small bottles that contribute to plastic waste. If you like the Urban Skincare range they use, it's available for purchase in the lobby. The toilet is also in the bathroom, while the compact sink is just outside. You'll find the iron and hairdryer in the drawers. 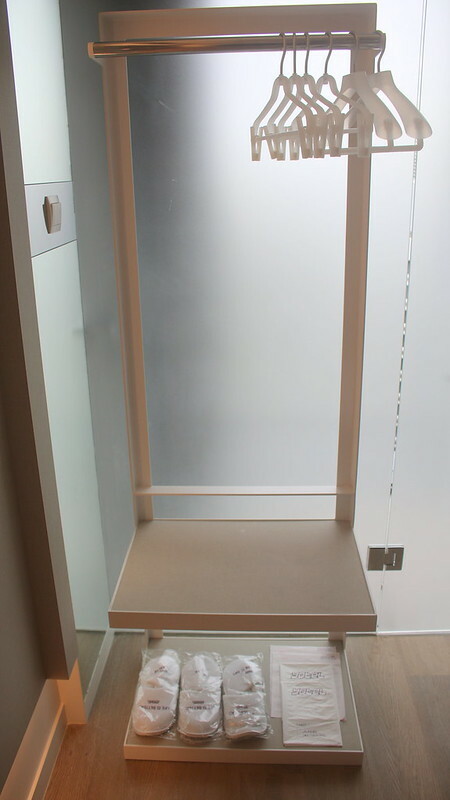 No stuffy wardrobe needed; your clothes can hang free on this wardrobe stand. The clean-looking walls actually hide quite a few items. 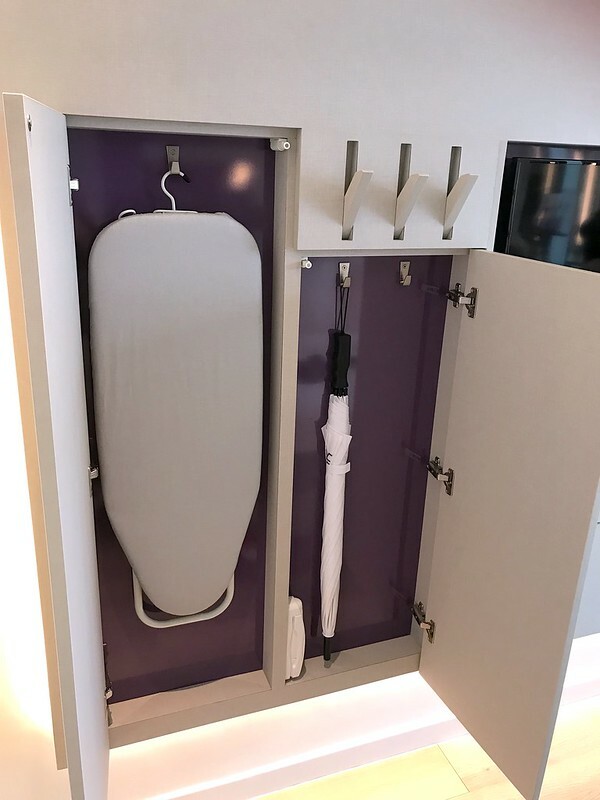 The ironing board, a thoughtful umbrella, and torchlight are cleverly tucked behind panels, while coat hangers can be pushed out when needed. 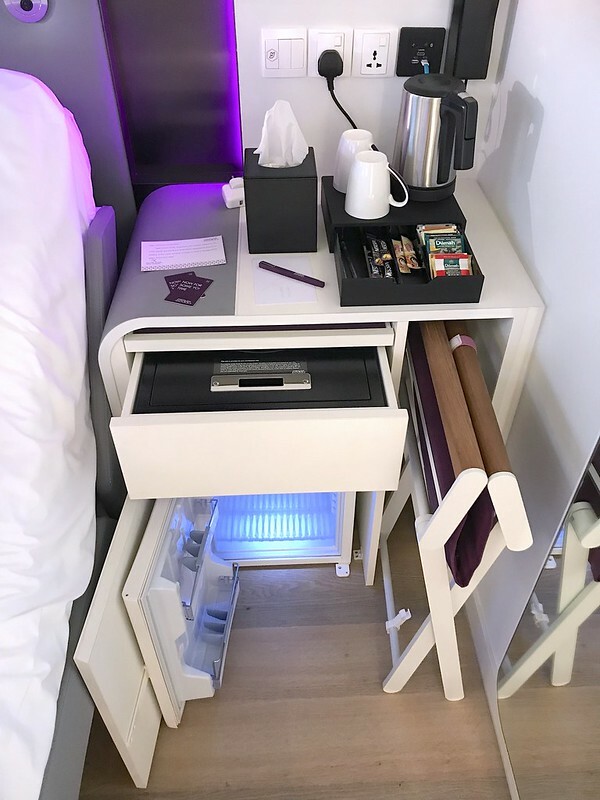 The bedside table also magically fits so many functions in one space. The lockable safe is in the drawer under the pull-out counter. The mini fridge is below that, and the expandable chair is tucked in the side. Need a workstation? Ta da! Seriously, I could live in a space like this. We adored the retro local snacks on the welcome platter. 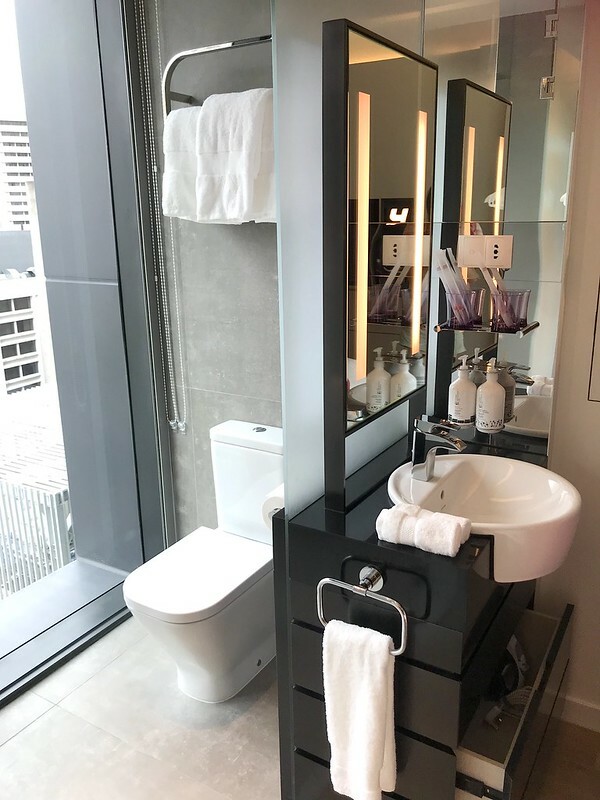 And now for the coolest feature of the hotel...awesome robot valets or delivery droids that will bring you additional amenities like water, towels and hangers. Call the number and indicate what you'd like, and the droids will come up to your room in no time. They'll even ring your phone to announce that they have arrived at your door. They each have their own voice and personality along with facial graphics on the touchscreen. And then they will return to their charging stations downstairs at the main lobby. These Techi robots are made by a Singapore robotics startup called Techmetics. They are the world's first multipoint hotel delivery robots, capable of making deliveries to as many as three rooms in one trip. 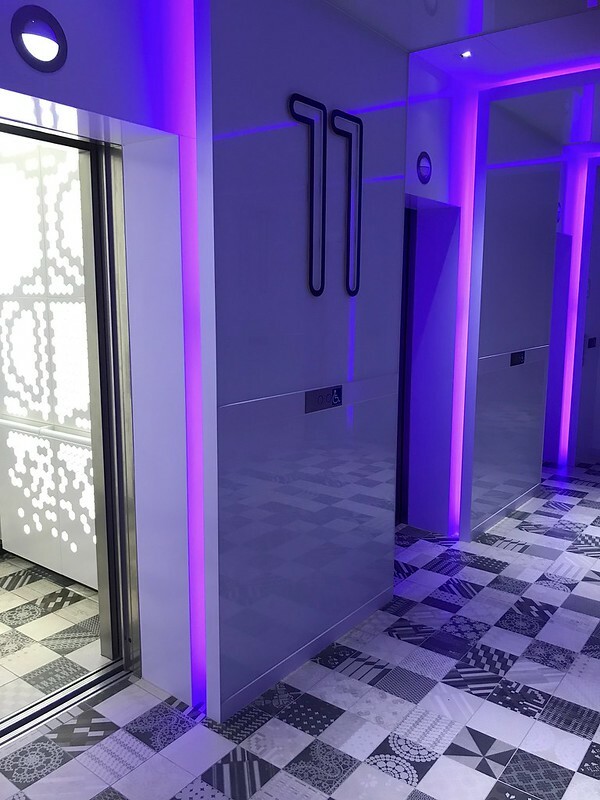 It's amazing how they seamlessly interface with the elevators to reach their destinations, and they are also programmed to sense obstacles/humans in the way and adjust their path accordingly. 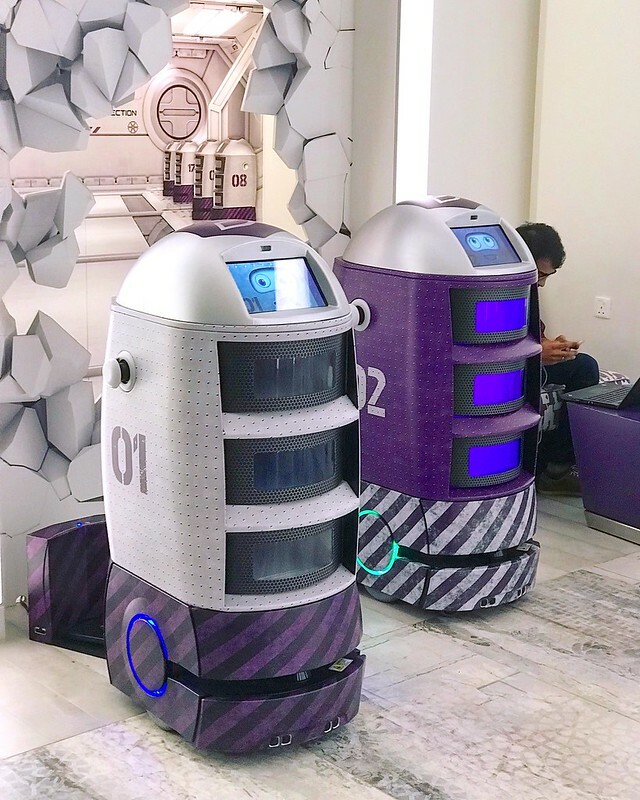 It will be a while yet before we get robots that can autonomously hijack AT-STs like BB-8 but these Techi robots will certainly bring a smile to guests and lend some efficiency to hotel operations. All around the hotel, there are interesting design elements like the tiles. Level 10 is where you'll find the Club Lounge, complete with pool and terrace. There are spaces for co-working, informal meetings and social gatherings. 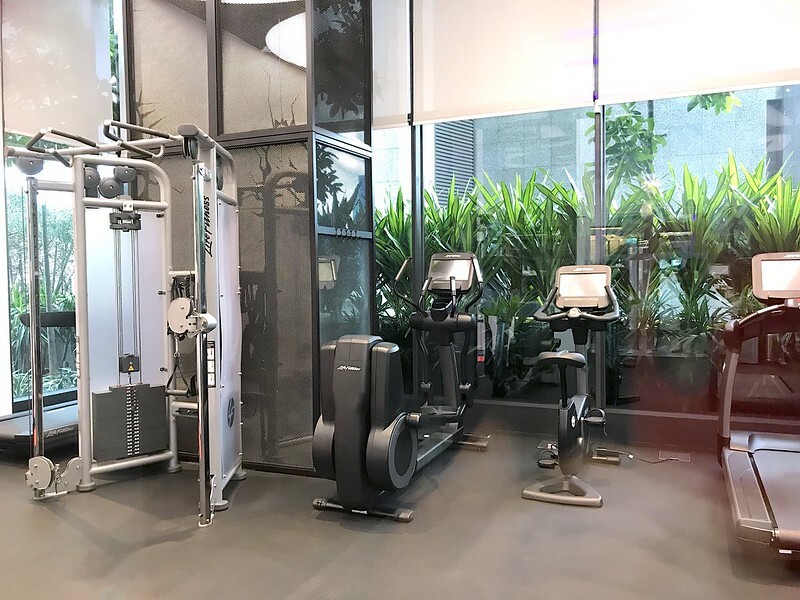 The gym is also here, and is open 24/7! 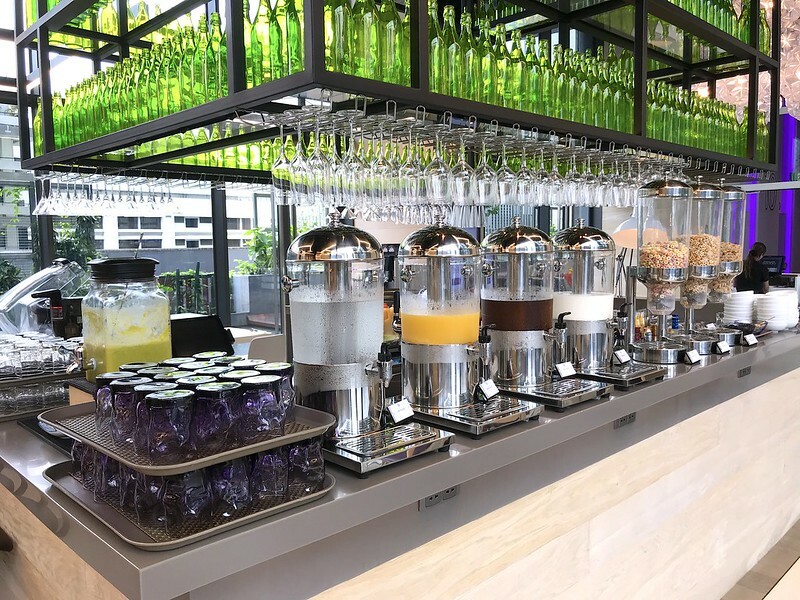 Also on this level is Grains & Hops Restaurant and Bar which offers nine varieties of rice bowls (beef, chicken, seafood and vegetarian) along with a selection of craft beers and cocktails. I'll have a separate post on the dishes we tried for dinner. 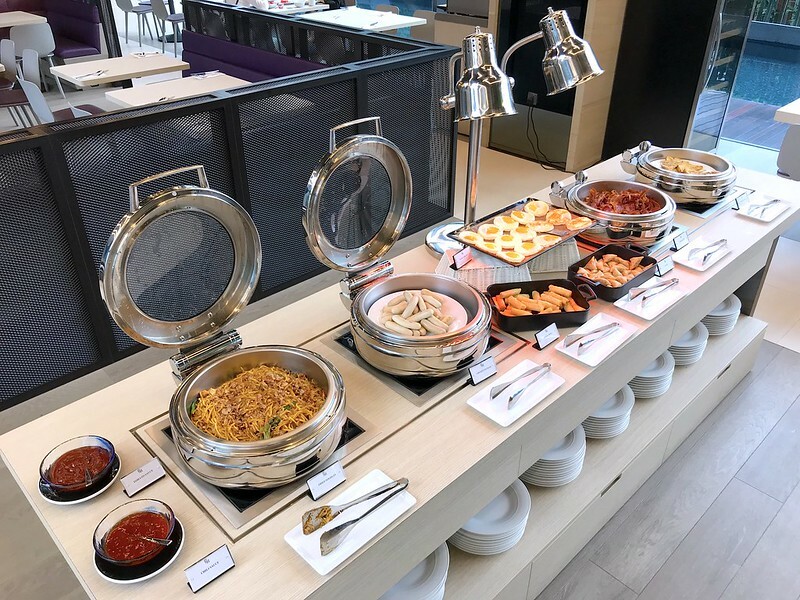 This is also where you'll have your buffet breakfast, and it's a small but well-curated selection. 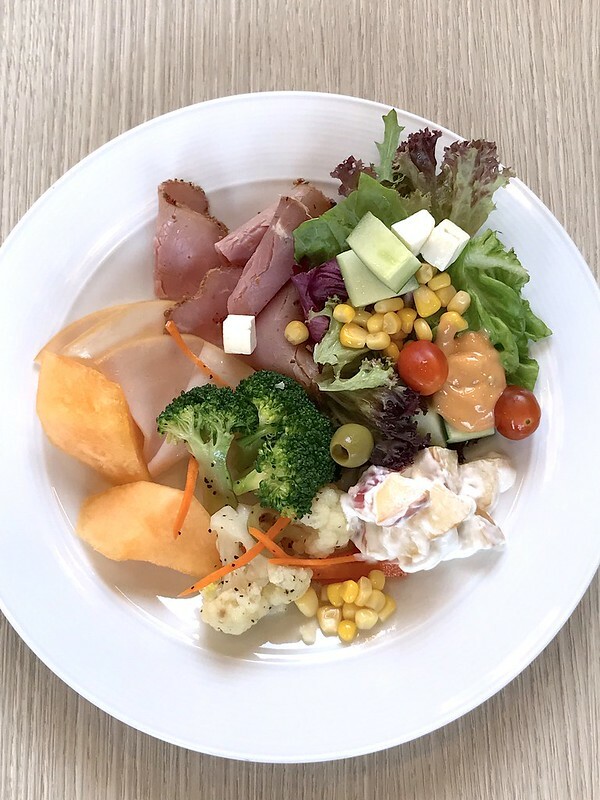 Start with some melon, ham, salads, and beef pastrami. 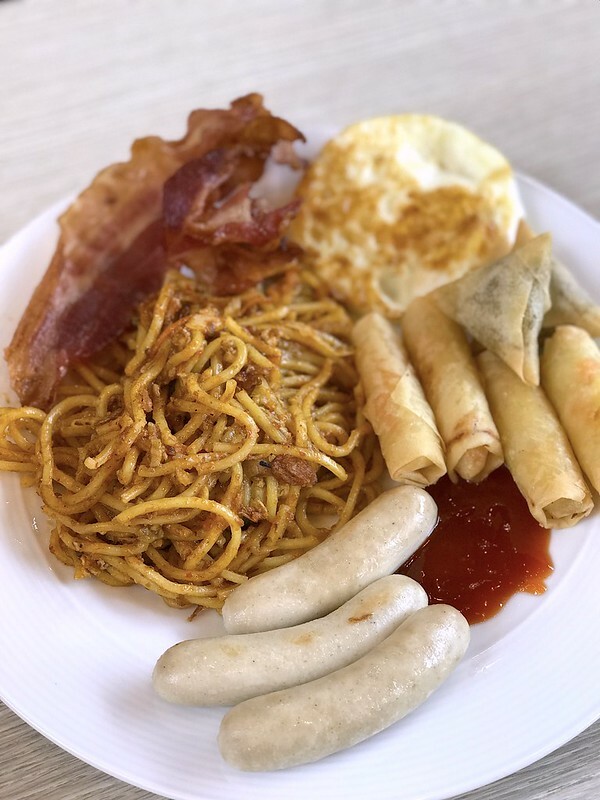 I loved the mee goreng! 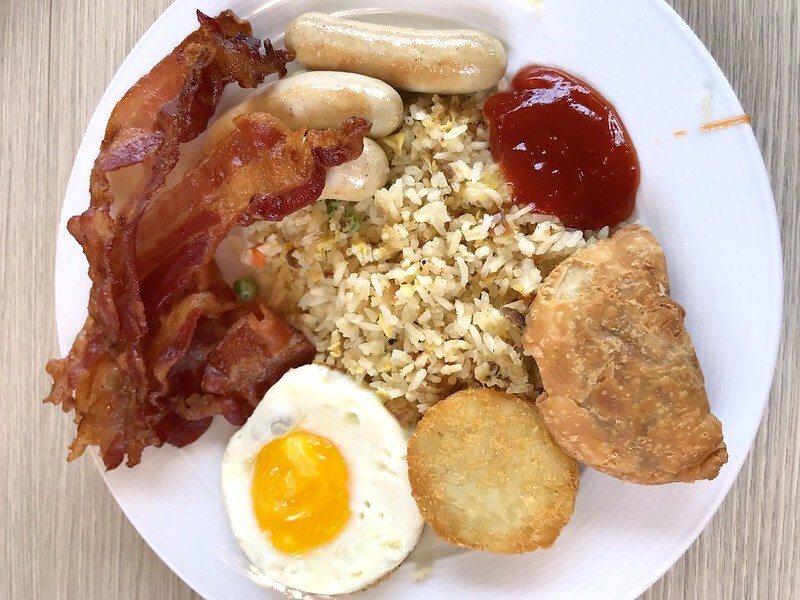 And it's great they have crispy bacon every morning. 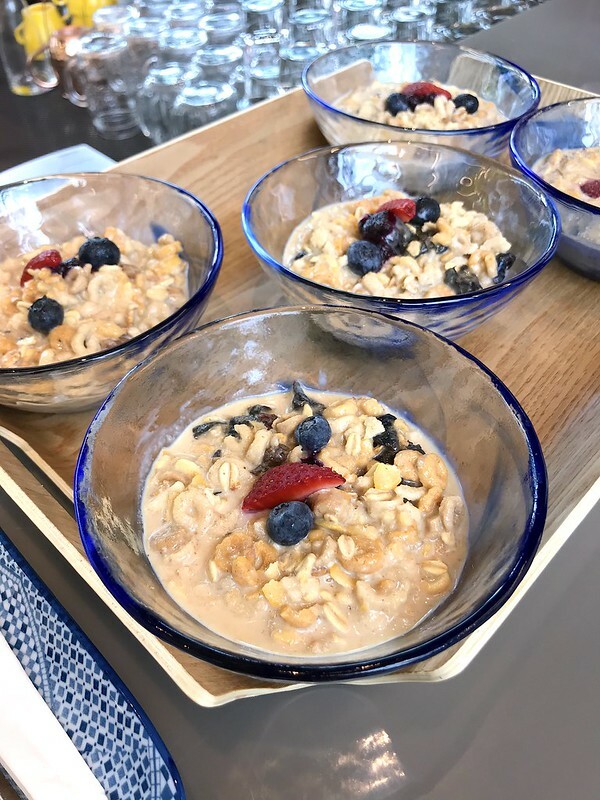 The bircher muesli or cereal grains is rather sweet. 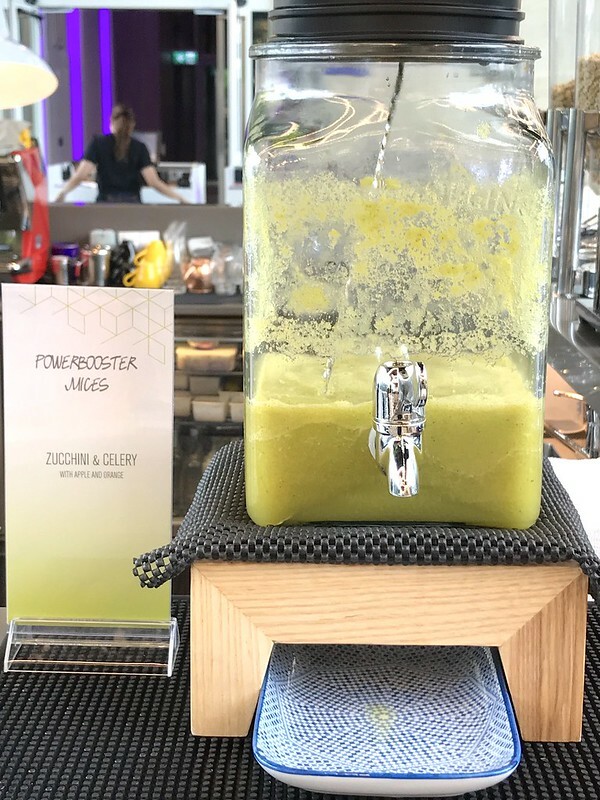 There's a health-focused juice mix that changes daily. 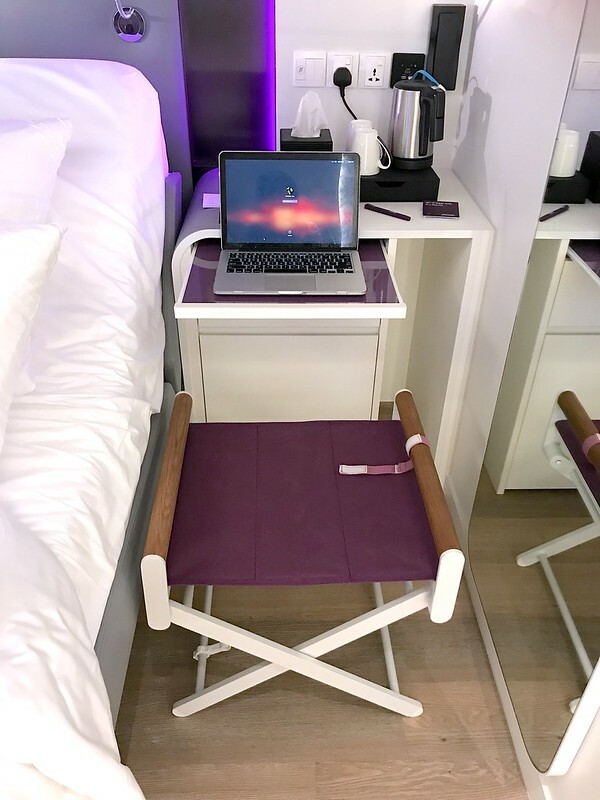 I am really glad I experienced Yotel. 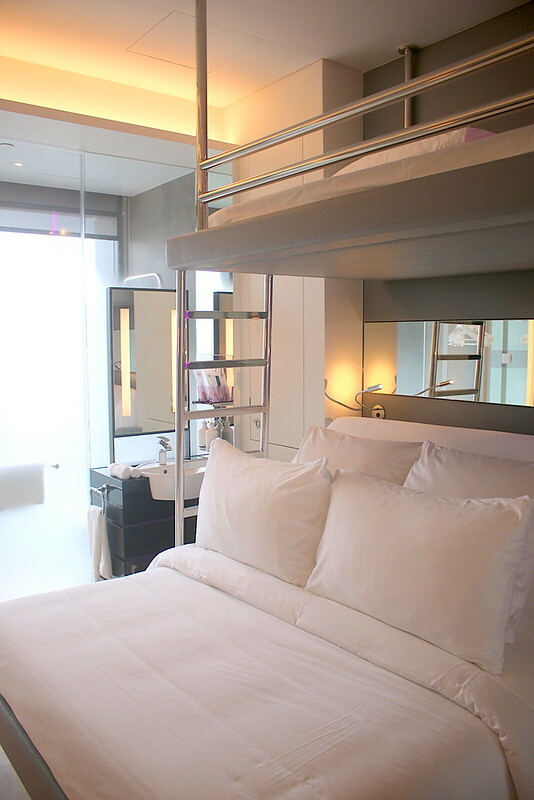 I love the first class travel concept being used to redesign hotel rooms; small spaces can be made so functional. I'd recommend it to singles and couples coming to town. The rooms may be a little bit small for families. For the accommodation quality and location though, it's seriously good value. 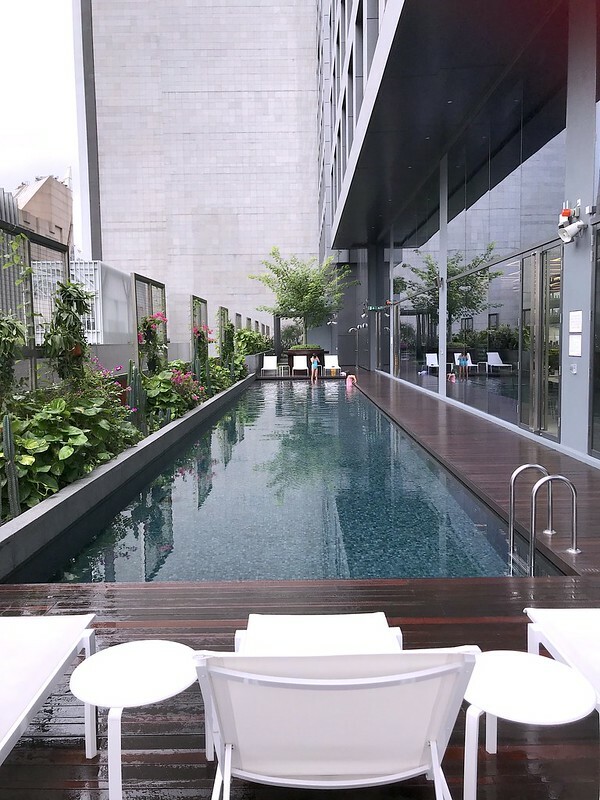 As a staycation option, it's pretty cool too. We want to come back just to try the robots again. 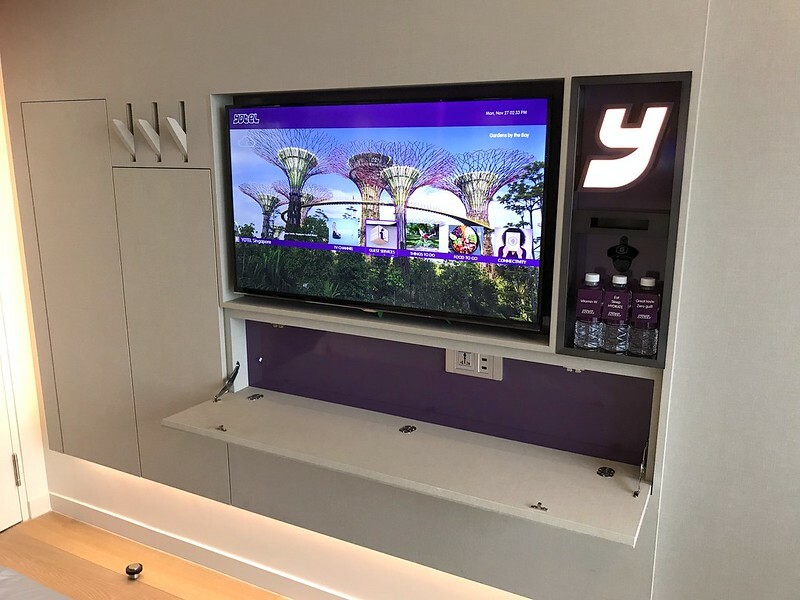 Room rates start from S$164++ for a one night's stay in a Premium Queen cabin.Bookings can be made directly on www.yotel.com. 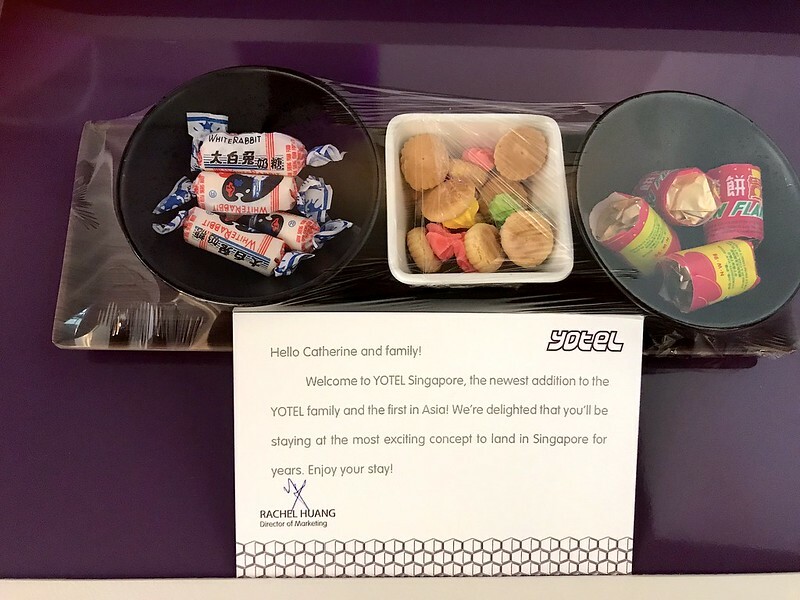 Many thanks to Yotel for the stay and hospitality! 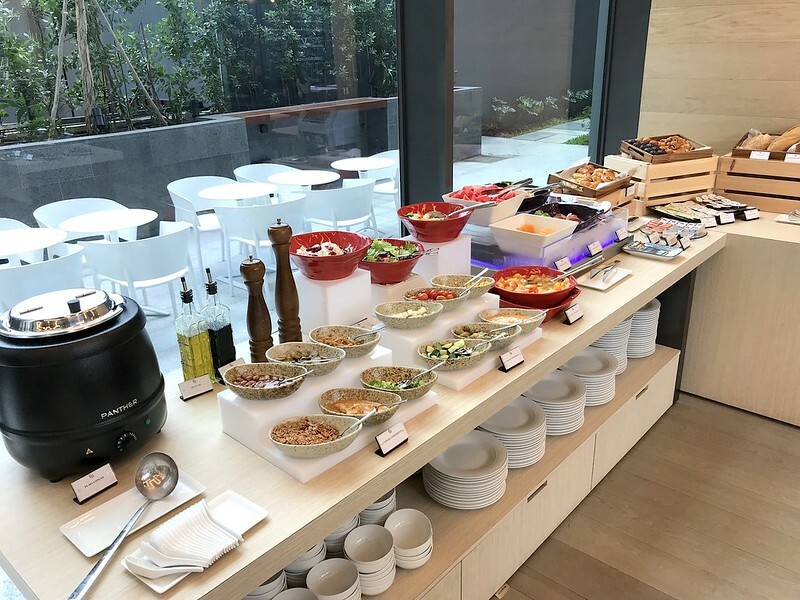 These are wonderful and nice yotel in singapore and having beautiful foods along with.